Calendar year returns: 2018: 0.4%; 2017: 4.8%; 2016: 5.9%; 2015: 2.0%; 2014: 5.3%. Source: Morningstar, 30.12.18. Performance is net of fees (I Share class, NAV based, including ongoingcharges), gross income reinvested (net of UK basic rate tax pre 05.04.16), in GBP. 2For illustrative purposes only. Prior to inception3 03.09.12, the Fund was known as the Managed Distribution Fund and was managed to a different investment objective. Calendar year performance source: Morningstar, 5 years ending December 2017. Source: Investec Asset Management, as at 31.12.18. The yield is based on the I Inc-2 share class. For further information on yields, please see the additional information section. Source: Morningstar, Bloomberg, BofA Merrill Lynch, Investec Asset Management, in GBP, as at 30.12.18. Annualised standard deviation of monthly returns over 3 years. For specific indices* information please refer to the Important Information section. The Investec Diversified Income Fund’s portfolio is built from the bottom-up with a focus on quality investments. This bottom-up focus helps to identify individual securities which are not only attractive but which also add defensive characteristics. 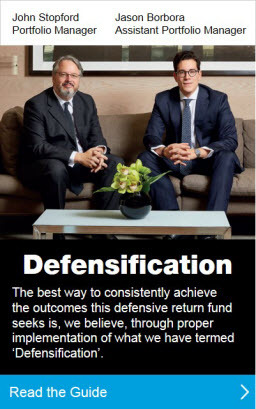 All investments are chosen for the way they behave in different market environments rather than on their basic labels and exhibit Growth, Defensive or Uncorrelated characteristics. Currency exchange: Changes in the relative values of different currencies may adversely affect the value of investments and any related income. Default: There is a risk that the issuers of fixed income investments (e.g. bonds) may not be able to meet interest payments nor repay the money they have borrowed. The worse the credit quality of the issuer, the greater the risk of default and therefore investment loss. Derivatives: The use of derivatives may increase overall risk by magnifying the effect of both gains and losses leading to large changes in value and potentially large financial loss. A counterparty to a derivative transaction may fail to meet its obligations which may also lead to a financial loss. Emerging Market: These markets carry a higher risk of financial loss than more developed markets as they may have less developed legal, political, economic or other systems. Equity Investment: The value of equities (e.g. shares) and equity-related investments may vary according to company profits and future prospects as well as more general market factors. In the event of a company default (e.g. insolvency), the owners of their equity rank last in terms of any financial payment from that company. Interest rate: The value of fixed income investments (e.g. bonds) tends to decrease when interest rates rise. Government securities exposure: The Fund may invest more than 35% of its assets in securities issued or guaranteed by a permitted sovereign entity, as defined in the definitions section of the Fund’s prospectus. What to do as the liquidity taps close? Do absolute return funds lack a performance anchor? 1This is an aim and not guaranteed. *Indices: Investment Grade Debt: BofAML Global Broad Market Corp TR USD; DM Government Debt: BofAML Global Governments Bond II TR USD; EM HC Debt: JPMorgan EMBI Global Diversified; EM LC Debt: JPMorgan GBI-EM Global Diversified; Global Infrastructure: S&P Global Infrastructure TR USD; High Yield debt - Global: BofAML Global High Yield TR USD; UK Equities: FTSE All-Share TR; Diversified Income Fund: Distribution Yield and volatility of I Inc-2 Net share class. If applicable FTSE data is sourced from FTSE International Limited (‘FTSE’) © FTSE 2018. Please note a disclaimer applies to FTSE data and can be found at www.ftse.com/products/downloads/FTSE_Wholly_Owned_Non-Partner.pdf. 4The yield reflects the amount that may be distributed over the next 12 months as a percentage of the Fund’s net asset value per share, as at the date shown, based on a snapshot of the portfolio on that day. Where there is a yield number in brackets, it is calculated in the same way, however, as the charges of the share class are deducted from capital rather than income, it shows the level of yield had these charges been deducted from income. This has the effect of increasing the income payable whilst reducing capital to an equivalent extent. Yields do not include any preliminary charg.e and investors may be subject to tax on their distributions. 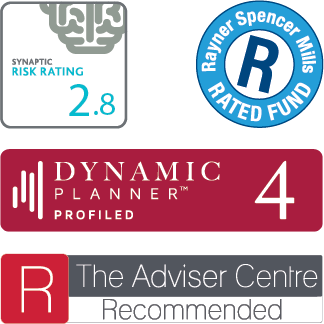 Dynamic Planner® is a registered trademark of Distribution Technology.